The story so far: Two days ago we discovered that Turkey is far bigger than any of us realised and we have been forced to drive long hours and into the night to make our visa deadline at the Iranian border. We only have the correct paperwork, Carnet de Passage, for two of our three cars. We are hoping to obtain the final Carnet at the border but we know this to be a big risk. Ant, sporting linen trousers and shirt, and I are at the breakfast table. Ant points out that I have done nothing but complain for the last five minutes, and then beckons the waiter over to send his omelette back. Joss joins us plate in hand. From the large buffet of cheeses, meats and other Turkish breakfast items he has chosen a roll and some honey, which is still in honeycomb form. A surprising choice given that he then announces he is unsure if honey in this form is edible. I think we may all be a little tired and anxious. We are all aware that today’s appointment at the Iranian border could have a great influence on our adventure. 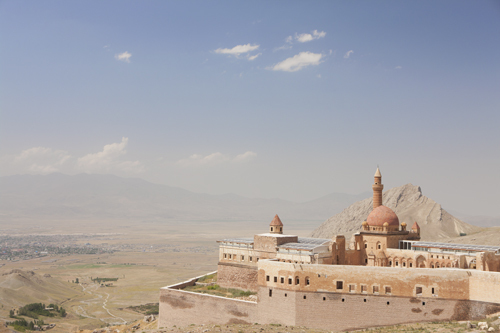 The morning drive through the remainder of Turkey sees the landscape become drier and drier. Cattle stand statuesque in the last oxbow remnants of rivers, and small domes of homemade bricks dry in the sun between tiny groups of ramshackle houses. As the foliage dies away the land takes on an increasingly lunar appearance. Red and green mineral deposit smear the soil of the rolling landscape. We pass through the border town of Dogubayazit at lunchtime. It’s bustling and intimidating and far poorer than everywhere we have been thus far. Small children whose faces are etched with far more experience than their years approach the car at every available opportunity, their hands outstretched. “Does that look like a line of traffic to you?” Thomas says as we approach the 10-kilometers-to-the-border sign. It becomes apparent he is right. It is a long line of lorries, but we are able turn into the oncoming lane and push cautiously on to the border. Mehmet is a small stocky man who has exceptionally even but heavily stained teeth. He doesn’t work for the border control authorities, but each day he makes the four-kilometre journey from his house to the border, where his sole purpose is to help people through the administrative process to exit Turkey. It is into his hands that we now fall. Not what I was expecting, but I affirm that I have heard of him. They look at each other. “Why you support West Ham?” one finally asks. A question I have asked myself many times. “You know Turkish teams?” They are unflinching in their gaze. This response has quite an unexpected effect. The two standing officials throw arms over each other’s shoulders and all three do their best to bounce up and down in the tiny booth whilst singing. All three are now grinning and laughing at each other. The seated official quite distractedly stamps my passport and hands it back to me. Mehmet grabs my arm and leads me to the next window. Slightly confused, I am standing in what could be loosely described as a queue with Joss. We are trying to discern through Mehmet’s broken English why we are queuing here. Our conversation is interrupted. I look up to find that two of the previous officials have vacated their booth. “Come over here,” one says. The six of us are directed towards yet another small booth — but this time on the Iranian side of the border. The passport official who frequents this particular booth has been studying our passports for around half an hour. Two things have become apparent: he has a very slow computer system, and the dates on English passports confuse him. What is particularly perplexing is his insistence on us writing them for him, which we do in exactly the same format as they are printed in the passport, but it seems to help. Eventually Ant can take no more and walks 20 meters away and leans on the bonnet of I Think I Khan. A smartly dressed middle-aged man who slightly resembles Don Johnson approaches him, and they start to chat. I notice the man withdraw a huge wodge of cash from his pocket. Five minutes later Ant strolls back to us and informs us that Don Johnson is offering very good rates of exchange and has also assured him that it will not be a problem to attain a carnet de passage for I Khan Make It. This is the news we had all hoped to hear, but it still seems far from a certainty. Over the next hours we deal with varying officials. Don J. and an associate of his, both men suffering from deodorant dodger syndrome, assist us through the varying processes until I Think I Khan and I Am Sure I Khan are driven into Iran. “Another 10 minutes” is a phrase that is repeated with great regularity over the next hour and a half whilst we wait for a friend of Don J.’s to arrive. The friend can, apparently, issue the carnet for I Know I Khan. He eventually arrives at 5 o’clock, walks once around the car, drops an extremely feminine pink lighter from his pocket onto the floor, sits himself down on a ledge, looks up and speaks Iranian incredibly quickly for about 30 seconds which Don J. translates: “tomorrow”. Our last action in Turkey was to pose for a group shot. This entry was posted on April 27, 2014 by laurienoble. 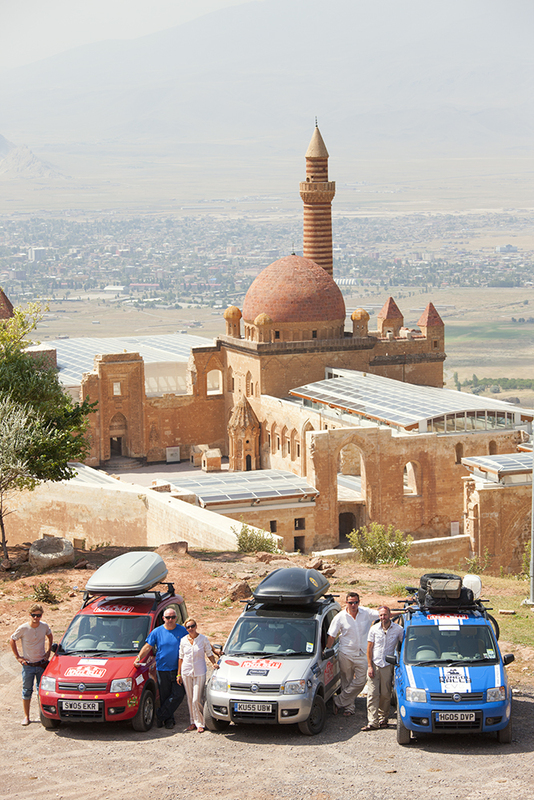 It was filed under Uncategorized and was tagged with 5D III, 5D Mark II, Canon, Canon 1DS III, Canon 24-70mm, Canon 70 - 200mm, Dogubayazit, Fiat Panda, Iran, Iran border, Ishak Pasha Palace, Mongol Rally, Photo, Photography, Travel Photography.